How to cover a Wedding Cake with Rolled Fondant icing. Here you'll learn how to make your own wedding cake and cover your cake with rolled fondant icing. There are more video tutorials with step by step instructions at the end of the page. There so easy, any novice can follow. When your wedding cake is covered with rolled fondant, it's so easy to decorate. You can either decorate your cake with silk or fresh flowers, swirls of buttercream frosting and or decorative scuptured sugar decorations. The sky's the limit. Rolled fondant wedding cakes are truely a modern day designer wedding cake experience for the do it yourself bride. 1. Brush your cake with a light layer of syrup - one part apricot jam, 2 parts water. 2. Once you'll brushed your cake, put it to one side. 3. Use white or ivory ready to roll fondant icing (for this example you need 750 grams). 6. Try to get the icing about 3mm think. 7. Measure you cake to make sure you have rolled out enough to cake your cake. 8. Place your cake in front you you and roll the rolling pin with the fondant icing, evenly over the cake. 9. Make sure the icing is long enough. 10. The first thing you do is secure the edges. If you don't secure the edges, the icing may rip due to the weight. 11. Next press the icing down onto the sides of the cake. Gently pull the icing forward and then press on to the cake. 12. Once you have pressed the icing on to all sides of the cake, take the smoothers and go around the cake to flatten the sides. 13. Use a non stick plastic knife with out the serated edges. Cut around the cake very closely and take away any excess icing and place it back into and air tight container. to avoid cracking. 14. Smooth the icing with the perspex smoothers to acheive a professional sharper edge. If you wish to have a rounded edge, you can skip this step. 15. The last step is to go over with your hands and feel for any air bubbles. Keep a pin handy and prick any bubbles to remove them. 16. Finish off with your perspex smoothers. Learning how to make your own wedding cake can seem difficult if you've never done it before. You may surprise youself as to how easy it really is. Making wedding cakes from scratch is really a lot of fun. You can do this with your bridesmaids or close family and friends. If you're looking for a dark fruit wedding cake recipe that will blow your socks off, here's one I regard as the perfect fruit cocktail cake. Tried and tested! This easy-to-follow recipe has step by step instructions, it will take the guesswork out of making your wedding cake. 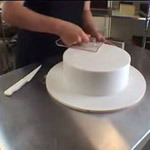 If you think you would enjoy making a wedding cake, here you'll find a step by step video tutorial with easy to follow instructions that any novice can follow. A two tiered wedding cake is easier than you think. Wedding cupcakes are a piece of cake, right? Well obviously - but if nobody's ever shown you how to make wedding cupcakes, follow this video tutorial, the wedding cupcake recipes are included. Wouldn't it be fantastic to be able to make expert wedding cake decorations using rolled fondant icing? 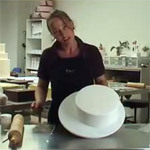 You'll learn how to make a decorative white bow to place on top of your finished wedding cake. This cupcake decorating video tutorial has easy to follow cake decorating instructions. You'll learn to make perfect yellow Begonia and pink Carnation buttercream flower cake decorations and other simple cake decorations. Create and execute your own cake decorating design ideas. Learn the fine art of cake decorating for weddings. This video tutorial will show you how to make sugar flowers to decorate you own wedding cake. It's a step by step cake decorating instructions on how to make expert wedding cake decorations. Here you'll learn how to cover your wedding cake with rolled fondant icing. Making it so easy to decorate. You can either decorate your cake with silk or fresh flowers, swirls of buttercream frosting and or decorative scuptured sugar decorations. The sky's the limit. Do you want to know the best and most efficient way to cover your cake with buttercream frosting? 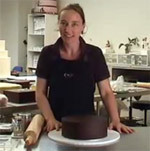 In this video tutorial you will learn how to achieve a perfectly smooth finish and prepare it for some simple cake decorations. This marshmallow fondant recipe is complete with instructions with a mini video with pictures. Marshmallow fondant is not so difficult to make. It's easy to work with, is deliciously tasty and the beautifully smooth white finish is the perfect base for wedding cake decorating. This delicious Swiss buttercream icing recipe is gorgeous and yummy and so easy to make, you'll wonder why you don't eat Swiss buttercream everyday. Psst! Too much of a good thing is a little naughty, that's why. This traditional vanilla buttercream frosting recipe is commonly used for icing wedding cakes as well as making decorative buttercream flowers. For piping, you need a slightly thicker butter icing mixture, so you'ld use a little less of the heavy cream or corn syrup in the recipe provided.